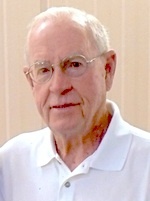 Wesley D. Gibson, 81, of Spring Hill, KS passed away April 16, 2017. Visitation 10:00 am Sat., April 22, 2017 at Bruce Funeral Home, Spring Hill, KS (913) 592-2244. Private family graveside service 11:30 am at Spring Hill Cemetery, Spring Hill, KS. Memorial contributions may be made to St. Jude Children’s Research Hospital. Wesley was born May 24, 1935 in Beatrice, NE to Elmer Clarence and Anna (Linsenmeyer) Gibson. He grew up in Beatrice where he also graduated from high school. Wesley served in the US Air Force for four years. He married Mariellyn Davis in Lincoln, NE on Aug. 14, 1956 and they moved to Spring Hill in 1972. Wesley worked as an Air Traffic Controller for 36 years in Detroit, Chicago and the Olathe Center; retiring in 1988. He enjoyed woodworking, playing golf, doing yard work and was active in many sports. More than anything Wes enjoyed traveling the world with his wife; and making memories with his grandchildren and great grandchildren. Wes was a Methodist. He will be missed dearly by family and friends. He was preceded in death by his parents; brothers: Elmer “Bud” and Robert “Bob” Gibson; sisters: Mary Meints and Katherine Gibson. Wesley is survived by his wife Mariellyn “Mary”; brother, Richard “Hoot” and wife Beverly “Bev” Gibson; sons: Steven and wife Pamela Gibson, Spring Hill, KS and Scott and wife Pam Gibson, Olathe, KS; four grandchildren; Scott Jr. and wife Ali Gibson, Reed and wife Melissa Gibson, Jake Gibson and Stephanie, Renee and husband Kris Rutherford; eleven great-grandchildren Chas, Chandler, Courtney, Carter, Annabelle, Owen, Elliot, Levi, Brandon, Rachel and Alyssa.